Foot protection safety signs are a visual reminder of the need to use foot and leg personal protective equipment (PPE) in the workplace. These are necessary to protect against a range of potential hazards including; wet conditions; electrostatic build up; slippery surfaces; cuts and punctures; falling objects; metal and chemical splash; and abrasion. The foot protection products are outlined in the Personal Protective Equipment Regulations 1992. Foot protection equipment can include safety boots, protective shoes, protective toecap footwear,wellington boots, riggers, anti-static safety boots, gaiters, leggings and spats. The signs indicate the need to use the appropriate footwear and their location of use. These mandatory safety signs and safe conditions safety signs are manufactured to comply with the harmonised standard EN 7010, and the Signs and Safety Regulations 1996, covering the symbol or pictogram, colour, and layout. Common applications include industry, manufacturing, construction, building, demolition, metals and steel making, mining, oil and gas, nuclear, chemicals, pharmaceuticals, telecommunications, utilities, agriculture, and municipal services. We also supply body protection signs, respiratory protection signs, head protection signs, eye protection signs, ear protection signs, and hand protection signs. Wear foot protection symbol safety sign. Wear boots symbol and text safety sign. Wear anti-static footwear symbol safety sign. Anti-static footwear must be worn symbol and text safety sign. Foot protection must be worn symbol and text safety label. 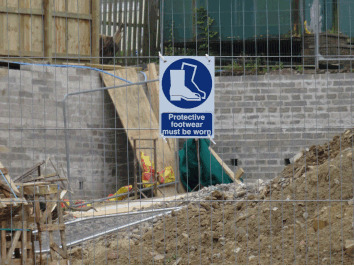 Protective footwear must be worn, mini safety sign.